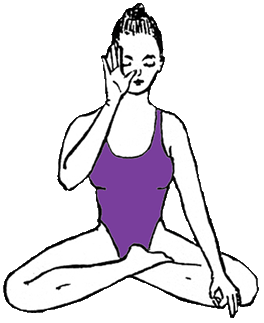 Pranayama, or breathing techniques, is fundamental to Kundalini Yoga and Meditation. Its practice helps us cultivate breath awareness and integrate conscious breathing into our daily life and yogic practice. Powerful breathing patterns significantly enhance the effects of the exercises and meditations. Pranayama oxygenates the entire body, clearing the mind, strengthening the nervous system, balancing the two hemispheres of the brain, cleaning the aura, detoxifying the body, improving digestion, and releasing fears, insecurity, irritability, depression, and other fear-based blocks. Pranayama exercises also balance prana and apana. Prana is the basic life force that animates our being. Apana is the energy that makes elimination possible. When the apana in the lower chakras mixes with prana (by applying the locks while suspending the breath), heat (referred to as tappa) is generated, which raises the Kundalini up the spine through the chakras. These breathing techniques are used in conjunction with specific postures and movements to create powerful effects. For the purpose of this lesson, we are going to cover three of these breaths. Full details of all of them along with a wealth of other information about the practice of Kundalini Yoga can be found in my book Introduction to Kundalini Yoga, Vol 1. To facilitate the free flow of our breath and pranic energy, we must keep our spine stretched upward. There are three stretch zones in our spine that correspond to the three sets of muscles that move on our inhale and exhale. Aligning and stretching the spine in these three zones facilitates deep breathing. Slightly pull your navel toward your spine to tilt your pelvis forward. Notice that instead of leaning forward, your posture will become more upright. You will be sitting on your sit bones, which connect you more solidly with the floor and facilitate grounding with the Earth. This position frees the belly muscles, which are able to relax and made available for long deep breathing. The muscles that surround the ribcage must be developed and strengthened to breathe long and deep. Lifting the solar plexus expands the chest and makes it easier to engage the major muscles of the diaphragm. The smaller muscles above the diaphragm are used to extend the breath to its maximum inhale. Some people prematurely cut off their exhalation and then initiate their inhalation with the use of the small respiratory muscles in the upper chest instead of using the muscles in the diaphragm. They think they have to emphasize the inhale to get enough air. However, a deep inhalation is dependent upon a full exhalation. Before your practice, observe your breath and notice the length of both your inhale and exhale. Some people emphasize the inhale and some emphasize the exhale. A simple exercise to increase your exhalation is to breathe through a straw. When you breathe through a straw, it takes longer to exhale and thus trains your body to exhale using the diaphragm. Blowing through a musical instrument and chanting a long tone also forces you to use your diaphragm to extend the sound being produced on your exhale. Practice extending a note as long as you can by engaging your diaphragm. With practice (1) both your inhalations and exhalations will significantly lengthen, (2) your diaphragm will become stronger, and (3) your diaphragm will automatically engage to produce your inhale and exhale. Ultimately, your breathing mechanism will be activated and will engage in long, smooth inhales and exhales. This practice is also a great way to improve your vocal capacity. creates the heat necessary to stimulate the awakening of the Kundalini. Pull the navel toward the spine on the exhale. The navel relaxes and goes back out on the inhale. This should be done as a rhythmic pumping. Focus on the short exhales. Only the exhale is active. The inhale happens automatically. Breath of Fire is a light, not a heavy, breath. Make sure the movement at the navel is staccato, relaxed, and rhythmic. Do not consciously engage the abdominal muscles. The breath will be too slow and get even slower and heavier. Do not tense or use the muscles of the chest, shoulders, or face. The muscles of the shoulders, chest, and ribcage remain relaxed. Feel the movement of air deep in the lungs and in the chest area. A common mistake is to actively inhale as well as exhale. This slows down the breath. Only the exhale is active. The inhale is the same length as the exhale, but we allow it to happen instead of making it happen. When Breath of Fire is done incorrectly, the abdominal, side back, ribcage, and shoulder muscles have a tendency to become tense instead of being completely relaxed. After a minute or two, the tensing begins to become tedious and sporadic, and the breath loses its rhythm. The result is that the energy from the breath does not flow to the areas under pressure from the exercise. Instead, the breath goes mostly to the external muscles of the abdomen, side back, ribs, and shoulders. We even use the muscles of our face, which, when under the strain of breathing improperly, becomes somewhat contorted. Start with long deep breathing to become aware of your abdominal and diaphragm muscles and your breathing mechanism. Panting with your mouth open is a helpful exercise for getting in touch with using the muscles of the navel and diaphragm to do quick rhythmic breathing. When learning Breath of Fire, practice the breath a short time (even a few seconds) and then stop. When the breath starts to feel heavy or not right, stop. Allow your breath to relax before recommencing. It often takes some time to get it right, so don’t force it. Just practice, stop, and start again. It may even take a few days until you get into the light rhythm. You will know when you get it because you will be able to continue for longer times without slowing down or building up tension. Left nostril breathing activates lunar energy and the qualities of patience and letting go. Do left nostril breathing to relax, calm the mind, and cool the nerves. It is soothing to do left nostril breathing any time you wish to relax and before going to bed. Block the right nostril with the right thumb and inhale and exhale through the left nostril only, using long deep breathing unless specified differently in a kriya. Right nostril breathing energizes and alleviates irritated, depressed, or unbalanced mental and emotional states. It activates solar energy and the qualities of strong will, perseverance, motivation, and the ability to take action and keep up. If you are tired, falling asleep, and need more energy, breathe through the right nostril. Block the left nostril with the left thumb and inhale and exhale long and deeply through the right nostril only. Or do Breath of Fire through the right nostril for a quick boost of energy. The simple formula is exhale and inhale through one nostril and then switch and exhale and inhale through the other nostril. Remember, the sides of the body expand on the inhale. The shoulders stay relaxed and do not move up and down. The powerful effects of the Kundalini exercises are attained by combining movement, breath and mantra. In Kundalini Yoga we either coordinate a powerful inhale and exhale with the movement or do Long Deep Breathing or Breath of Fire, with poses that are held. All breathing during the exercises, both the inhale and the exhale, is done only through the nose with the mouth closed, unless otherwise specified. The use of a mantra, chanted internally helps to focus the mind and clean the subconscious mind. The mantra that we use is Sat Nam - lesson 5. During the exercises, mentally chant Sat on the inhale and Nam on the exhale. 1. Sit in Easy Pose. Make an antenna of the right hand’s fingers and block the right nostril with the thumb. Begin long deep breathing through the left nostril for 3 minutes. Inhale and hold for 10 seconds. 2. Repeat the first exercise, but use the left hand and breathe through the right nostril. Continue for 3 minutes. Inhale and hold for 10 seconds. 3. Using the thumb and the little finger to close alternate nostrils, inhale through the left nostril and exhale through the right with long deep breaths for 3 minutes. 4. Repeat exercise 3, except inhale through the right nostril and exhale through the left. 5. Sit in Easy Pose with hands on knees in Gyan Mudra, thumbs and forefingers touching, elbows straight. Begin Breath of Fire. Totally center yourself at the brow point. Continue with powerful Breath of Fire for 2 to 7½ minutes. Then inhale, circulating the energy. Relax or meditate for 5 minutes, then chant long SAT NAMs for at least 3 minutes, but for up to 11 minutes if you want. COMMENTS: This set opens the pranic channels and balances the breath in the two sides of your body. It is often practiced before a more strenuous, physical exercise. It is great to do by itself whenever you need a quick lift and a clear mind. It strengthens the nervous system, energizes, calms, and balances. Feel the delicate pranic aliveness and increase of voltage, energy, lightness, and radiance throughout your body. Pay attention to different parts of your body (abdomen, sides, legs, lower spine, middle and upper parts of the back, solar plexus and chest, the shoulders, neck and throat, facial muscles, lips, jaw, eyes, and forehead), breathing into and relaxing each and every area. Use awareness to allow the energy being generated during an exercise to go to the actual areas being stimulated by the posture or movement. With awareness feel the sensations in your body and notice where there is tension, stress, or numbness. Release and relax these areas by allowing what you are feeling. Click Here for more on Pranayama.